AstralPool Aster D1200 Side Mount Sand Filter 48″ 52,000 Liters/Hour, Multiport Valve (2.5″ Magnum) not included and must be purchase separately. Made in Spain. Beige laminated polyester and fibreglass body with boltless lid and polypropylene base. Equipped with pressure gauge, water drainage plug, and multiport valve. Maximum working pressure: 2,5 kg/cm2. Filtration velocity: 50 m3/h/m2. 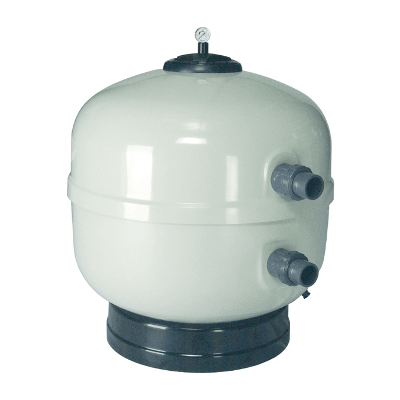 Sand filters, laminated with polyester/fibreglass resin. Comes in gray Ral 7038. Equipped with collectors of 1″ diameter and diffuser of highly resistant PVC and PP plastic. Fitted with pressure gauge, manual air and water purge valves. Side-mount 6-way multiport valve with filter, backwash, rinse, recirculate, waste and closed. Screwless cover for quick opening and closing. – Maximum flow rate: 50 m3/h/m2. Maximum operating pressure: 2,5 kg/cm2. Easy handling: A patented system is used for opening and closing the cover, thereby eliminating the use of traditional screws. The system also exerts uniform pressure over the entire watertight joint and makes it easier to loosen the cover. Capacity: 1″ collectors increase the filtering surface and improves efficiency. Functionality: Fitted with an AstralPool multiport valve with 6+1 positions for filter, backwash, rinse, recirculate, waste and closed. A valve so reliable, it’s used with most AstralPool filters.